Swami Vivekananda (1863-1902) was the foremost disciple of Ramakrishna and a world spokesperson for Vedanta. 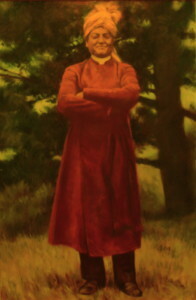 His lectures, writings, letters, and poems are published as The Complete Works of Swami Vivekananda. He felt it was best to teach universal principles rather than personalities, so we find little mention of Ramakrishna in the Complete Works. Swami Vivekananda represented Hinduism at the first World Parliament of Religions in Chicago in 1893 where he was an instant success. Subsequently he was invited to speak all over America and Europe. He was a man with a great spiritual presence and tremendous intellect. 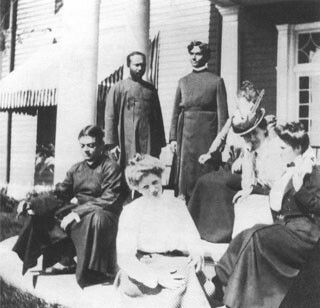 Most of the Vedanta Societies which were founded in America and Europe up through the 1930s can trace their origins directly to Vivekananda or the people who heard him speak from 1893 through 1900. After his first visit to the West, Swami Vivekananda returned to India and founded the Ramakrishna Order in 1898. (source:Vedanta Society of So. California) You can read the complete works of Swami Vivekananda here (opens in a new window).